This week a bipartisan majority of lawmakers overwhelmingly voted to reauthorize the Export-Import (Ex-Im) Bank. Our U.S. Rep. Martha McSally was one of the 313 members who voted to reauthorize Ex-Im and for that she should be applauded. Rep. McSally understands that increased trade means jobs and Ex-Im is a vital tool for businesses to hire more workers. It has supported over 5,000 jobs in Arizona between 2007-2014. And several of the 1,300 companies the Tucson Hispanic Chamber of Commerce represents have used it as a way to create high-paying jobs. Some in Congress claim that Ex-Im chooses winners and losers; however, the only winners are U.S. companies at the expense of foreign competitors. I commend Rep. McSally for standing up for Arizona jobs. The Senate needs to follow the House’s lead and vote to reauthorize Ex-Im. With his Nov. 1 article on paleoclimatologist Jessica Tierney (“Inked researcher writes own climate histories”), Tom Beal continues his stellar record of bringing the work of local scientists to Star readers in digestible form. My only suggestion for improvement would be for his articles to appear more often. Frankly, I am disappointed by the lack of media attention (TV, newspaper, etc.) that has been given to recall petitions for Tucson Unified School District board members Adelita Grijalva, Cam Juarez and Kristel Foster. These three voted to give the superintendent a 25 percent pay raise. This money could certainly have been better spent purchasing items for our children. I would urge readers to sign these petitions so this does not happen again. We only see news when Israeli lives are lost, although Palestinian lives are every bit as precious. The violence against Palestinians is ongoing. It includes detention of children as young as 12 who are not given a trial or even charged. As Americans, we are complicit in this oppression because of the $3 billion in military aid our government gives to Israel every year. If we care about peace and justice, our only option is to support the growing nonviolent boycott, divestment and sanctions movement. The bewilderment of the local leaders at the complete rejection of the county bond packages is bewildering. The county Board of Supervisors got too greedy. Others have lamented that the roads and the flood control portions were absolutely critical, so why didn’t the county focus on these? 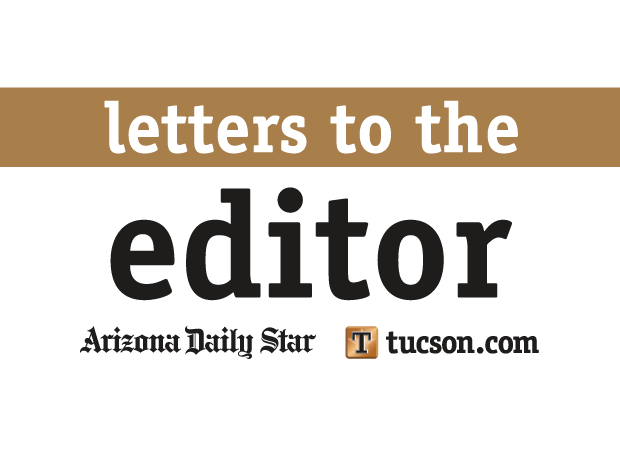 The overwhelming support for Tucson’s $100 million roads bond showed that voters will support well-focused, essential projects. The passage of most of the school budget overrides also shows that local citizens will support good projects. A $200 million county bond for roads and flood control would probably have passed. This is an election question that should be answered. Proposition 405, which would give the mayor and council a nice raise, was soundly defeated. If the people didn’t think they were doing a good job and didn’t deserve a raise, why did they vote to re-elect them? 1. In 13 years of living at our home we have seen our taxes double. 2. We live on a dirt road that rarely gets tended to by the county. It got its best attention when Twin Peaks Road went in, nearly four years ago. 3. Why do property owners have to pay for everything? Why can’t we increase the sales tax or do a gas tax? That way everyone helps to pay, not just property owners. Until we come up with solutions that has everyone who lives here paying for the needed improvements, I will vote no.